1. For the Béchamel: bring milk and everything except for butter and flour to simmer. In separate saucepan, cook bacon over medium heat until just crisp. Remove bacon, but keep fat in pan. If there aren’t six tablespoons fat, add difference in butter. Melt, then add flour. Stir until doughy and nuttily fragrant (about one minute). Strain in milk half-cup at a time, whisking to incorporate in butter-and-flour mix. 2. Take off heat, and add grated cheese. 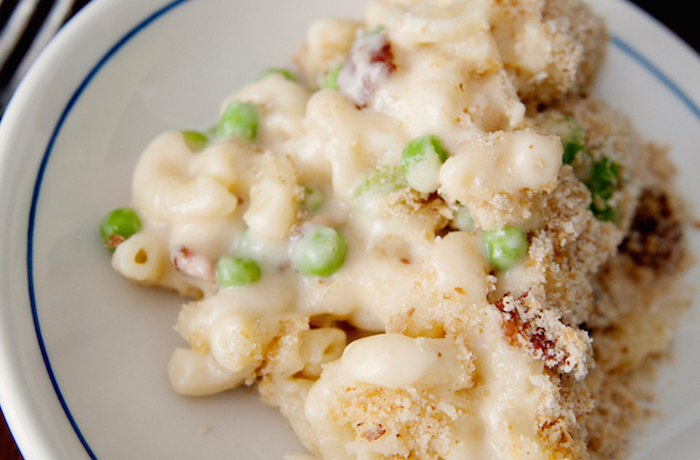 Fold in macaroni, peas, and a quarter-cup bacon pieces. 3. Meanwhile, mix bread crumbs with quarter-cup bacon pieces, pinch of salt and pepper, and tablespoon melted butter. Pour into greased baking dish. Top with bread crumbs, and bake for 30 to 45 minutes or until sauce is bubbly and crust is browned on top. Claire Thomas is the creator behind The Kitchy Kitchen, a drool-inducing food blog and cookbook. Aside from photographing and sharing her delicious kitchen creations, Claire dishes out cooking tips on her YouTube channel. And she doesn't stop there... Claire has hosted two seasons of the ABC series Food for Thought and has directed and styled commercials for some of the nation's top food brands. 2014 #TBT® Red Blend. Made with juicy Merlot and sustainably farmed Sangiovese, our newest #TBT highlights red fruit and spice, as well as a silky texture and bright flavors of red cherry and cocoa. Pair it with pizza, pasta, and lasagna!